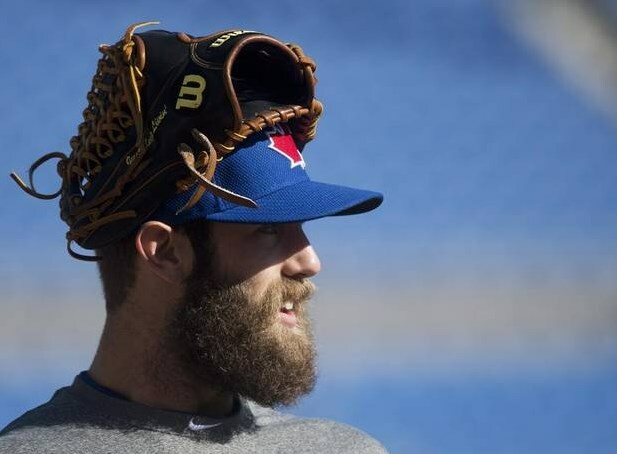 You may have seen on any number of news outlets that Daniel Norris (Instagram)—Blue Jays #1 prospect, a southpaw with a staggering repertoire of pitches including the dirty curveball with which he introduced himself to David Ortiz—lives out of his 1978 Volkswagen Westfalia microbus (named “Shaggy”). Despite a handsome salary and an endorsement deal with outdoor brand Patagonia at just 21 years old, the Jays’ future ace sees no need for excess. Norris lives the mantra, “Waste not, want not.” He has everything he needs—food, shelter, clothing—to live and pursue his passion, to be a pro ballplayer. Besides, when you live in a van, you’re not exactly long on space. But what about the gear?!? Oh, that’s another story, people. When it comes to Wilson leather, Norris tosses his minimalist spirit right out the Westfalia window. He loves them, collects them, swoons over them, calls them “family,” and shows them off on Instagram between photos of Nicaraguan sunsets. The Wilson with the finger hood seen above was Norris’ Science Hill High School sweetheart, down in Johnson City, Tennessee, and now, with all this fame and fortune, he’s got options. Norris sent WPW the shot above this morning, a good look at the seven bachelorettes vying for his love and affection. With such a stable of beauties, how do you pick just one to take to the dance? We can probably surmise that the 1799s (H-Webs) are just shag(gy) gloves, because in the time we’ve been doing this, only three pitchers, JP Howell, Huston Street, and Zack Greinke, have ever taken an H-Web out on the bump. Most recently, we’ve seen Norris in Spring Training with the black-and-tan GG47 (two photos up in-game AND in the lead photo **on his head**), however, we also caught him giving the Yellow Gold B212 the bedroom eyes (above). We know he’s got his work cut out for him, so lets help Daniel out and take it to a vote—or be a “me-guy” and head straight to WilsonCustomGloves.com to design your own.